Two veteran Russian spacewalkers ventured outside the International Space Station for over seven hours on Thursday to complete a variety of external work on the Station’s Russian Segment. Working overtime, Expedition 52 Commander Fyodor Yurchikhin and Flight Engineer Sergey Ryazansky spent seven hours and 34 minutes outside the Station to test an upgraded version of Russia’s Orlan space suit, release five small satellites, install a science package studying the effect of thruster exhaust on different materials and collect surface samples from various locations. Thursday’s EVA ran over an hour longer than planned as the two Cosmonauts battled with a stubborn strut and two hand rails that would not easily fit in their desired positions, requiring extra time and effort to get at least two of the three installed properly and checking off all but one EVA objective. 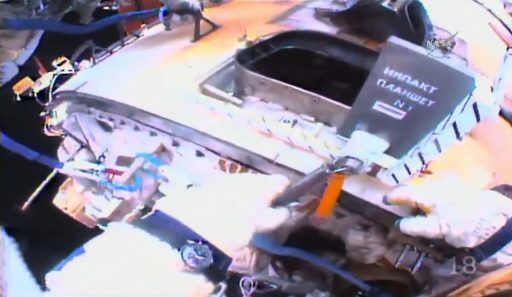 Thursday’s spacewalk marked the 43rd Russian Stage EVA conducted on ISS and the 202nd overall spacewalk dedicated to ISS Assembly and Maintenance that now stands at an aggregate of 1,258 hours of spacewalking time. It was the seventh spacewalk of the year, following up on six EVAs conducted on the U.S. 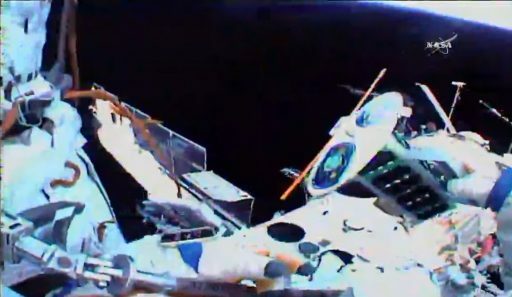 Segment of ISS that finalized the replacement of a dozen batteries on the Station’s truss, outfitted Pressurized Mating Adapter-3 after its relocation, replaced a payload controller and dealt with a failed external computer box. Unlike the USOS EVAs conducted this year, Thursday’s Russian excursion was not geared toward external maintenance and instead focused on utilization tasks and science, featuring three principal work sites on the Russian Segment – taking the crew members, armed with GoPro cameras, to the back end of ISS to deploy an experiment unit on the Zvezda Service Module before working on the Poisk and Pirs modules to obtain surface samples, install exposure units and put in place handrails to help future spacewalkers. 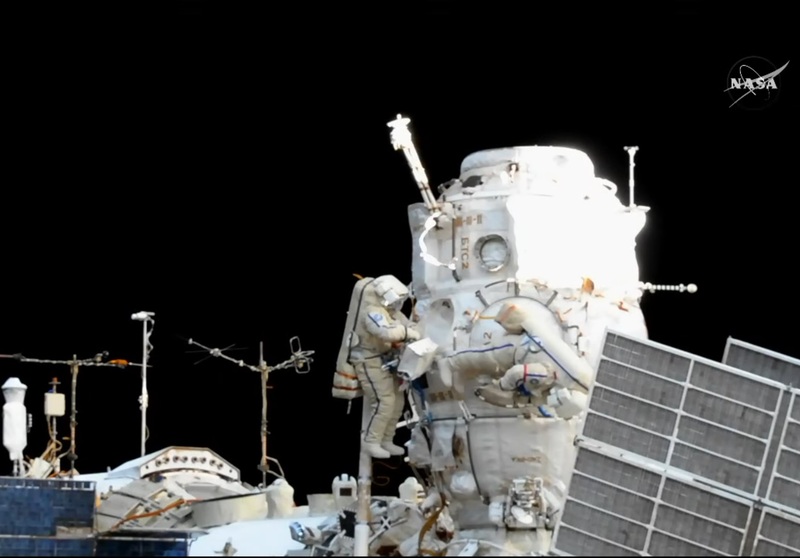 Thursday’s EVA was handled by two very experienced spacewalkers. 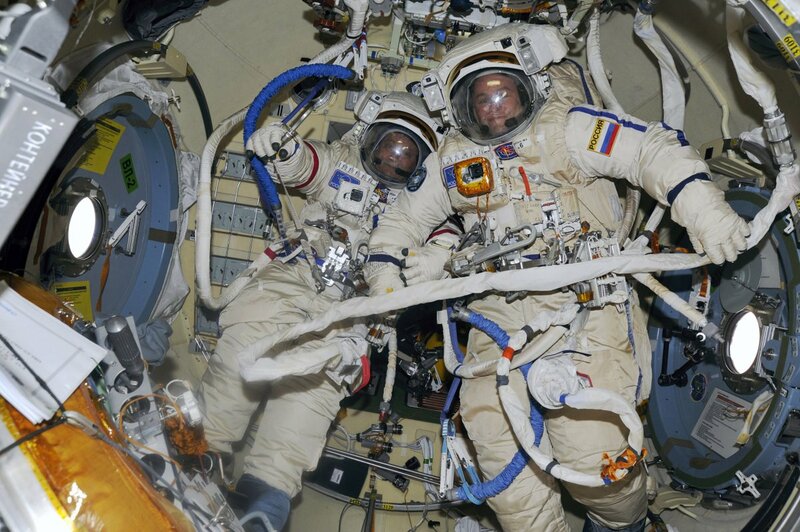 Fyodor Yurchikhin, currently on his fourth long-duration mission to ISS, completed his ninth career EVA, now with a total of 59 hours and 28 minutes – ranking fourth on the all-time record list for cumulative EVA time. It was Sergey Ryazansky’s fourth career EVA, now with a total EVA time of 27 hours and 39 minutes. 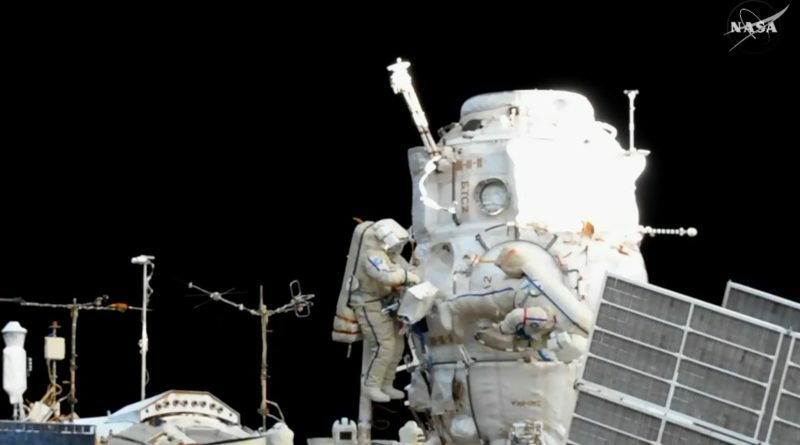 Known as EVA-43 in the numbering system of Russian Stage EVAs, Thursday’s excursion was the first Russian spacewalk in over 18 months, following up on a February 2016 EVA by Yuri Malenchenko and Sergei Volkov. The start of EVA-43 was marked at 14:36 UTC when Sergey Ryazansky, wearing the Orlan-MK No. 6 space suit, opened the hatch of the Pirs module following several hours of EVA preparations that took the crew through suit-up operations, suit systems checks and eventually the depressurization of Pirs for in-suit pre-breathe and leak checks that ultimately cleared the way for an on-time start of the spacewalk. 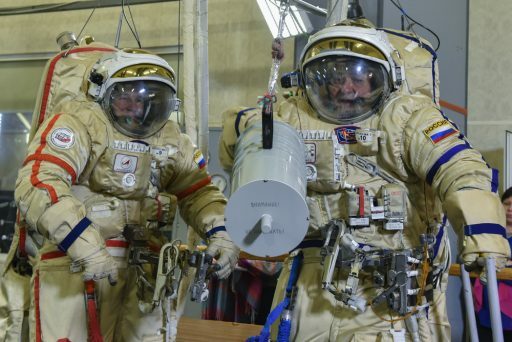 Fyodor Yurchikhin was wearing Orlan-MKS No.4 – the first of the upgraded Orlan MKS space suits to reach ISS, delivered earlier this year by the Progress MS-05 cargo vehicle after the first MKS suit was lost in the Progress MS-04 launch failure. Orlan-MKS offers a number of enhancements geared to providing greater safety and comfort to spacewalking crew members. The suit inaugurates an automated thermal control system and suit management computer that takes over suit management and thermal adjustment tasks that were previously done manually by the Cosmonaut. The pressurization layer of Orlan-MKS uses a new material that is more durable and has an internal capability of withstanding failures, allowing a backup protection layer to be removed to make the suit more flexible and reducing its mass to 110 Kilograms. Orlan-MKS also uses Lithium Hydroxide for carbon dioxide scrubbing and is easier to maintain, reducing the time needed in preparing for a spacewalk. User interfaces are improved via a larger color display to output suit parameters and allow the spacewalker to manually adjust the temperature based on their comfort levels. Orlan-MKS started development around 2012 and went through extensive testing on the ground before the first units were ready for transfer to ISS to undergo initial in-space verification. The suits are built for a service life of at least six years and can be used for up to 20 spacewalks without major refurbishment. Fyodor Yurchikhin was asked throughout the EVA how the thermal control system was behaving and had no complaints at all regarding the suit’s performance aside from a minor telemetry problem that prevented Mission Control from seeing fan speeds. 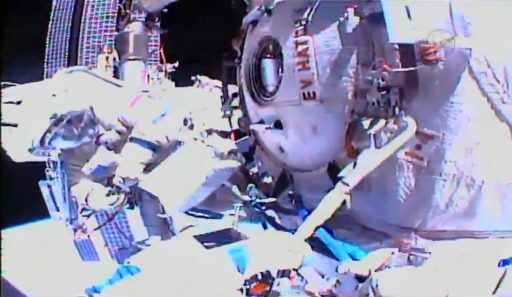 Embarking on EVA-43, Sergey Ryazansky was first to depart the Pirs airlock to set up shop on the EVA ladder for the first hour of the spacewalk, dedicated to deploying five Cube and Nano Satellites. The first item on the EVA checklist was the removal of the Restavratsiya experiment that was performed on EVA-42 and left outside in the space environment for 18 months. Restavratsiya consists of a tray holding several rigid plates which were used to test out a device for applying an adhesive thermal protection foil that could be used on future external repairs, provided the tape can weather the space environment over an extended period of time which will be confirmed by returning the experiment package to Earth for examination. With Restavratsiya safely tucked away inside Pirs, the spacewalkers took their position for the satellite deployment – Ryazansky placed next to the EVA ladder and Yurchikhin halfway out the airlock. Unlike the robotic satellite deployment infrastructure on the U.S. 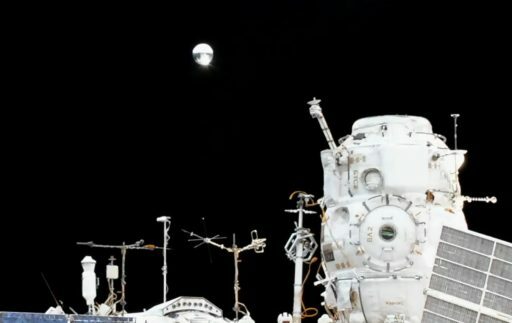 Segment, the Russian approach is more low-key using a manual deployment by spacewalking Cosmonauts – literally throwing the satellites overboard into an aft-nadir direction that ensures there are no re-contacts between ISS and the NanoSats. First up was the TOMSK-TPU-120 satellite of Tomsk Polytechnic University, deployed by Yurchikhin at 15:10 UTC after waiting on ISS for over a year to be set free. The 3U CubeSat features an all-3D-printed structure and sensor equipment to determine the effects of the harsh space environment on a 3D printed satellite and the craft carries an amateur radio payload commemorating the 120th anniversary of Tomsk PU. The Tanyusha SWSU №1 & №2 satellites were released by EV-2 in close succession at 15:15 and 15:16 UTC to remain in relative proximity to one another to complete an inter-satellite communications experiment. Weighing in at 4.8kg, each of the satellites has a 3D printed structure and the two will test out a peer-to-peer type data network that could be used for the self-organization of large satellite constellations with a high degree of autonomy for adding new satellites to the network and removing failed ones. They also carry vacuum gauges developed to measure the density of neutral and charged particles in the upper atmosphere and amateur radio transmitters will send voice greetings in four languages. TNS-0 №2, he second Tekhnologicesky Nanosputnik, was released at 15:21 UTC as a cooperation within Russia’s government-industry complex to establish a standardized platform for microsatellites. The 20 by 65-centimeter satellite weighs 5.1 Kilograms and tests out attitude, power and communications systems for future operational TNS satellites that will conduct scientific missions through GNSS radio occultation measurements and Earth observation. 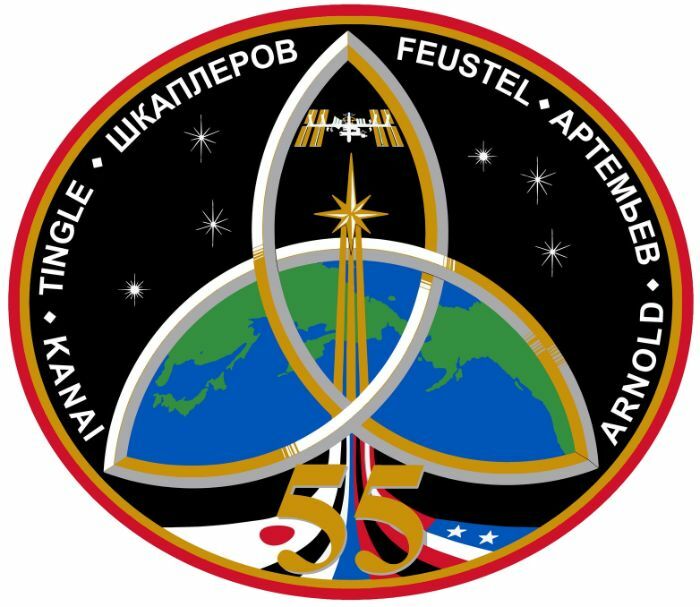 The last satellite, deployed at 15:29 UTC, was TS-530 Zerkalo (a.k.a. Sfera-53 No.2) – a 53-centimeter sphere with a mass around 13 Kilograms to provide a calibration target for ground-based radar and optical sensing systems and to study atmospheric density as a function of altitude and external influences like solar activity. It was the second such satellite deployed from ISS, following up on the original Sfera-53 that was released in 2012 and remained in orbit for around three months. With all satellites receiving their send-off, the spacewalkers re-organized the airlock – stowing the covers from the satellites and retrieving equipment for the next major EVA task taking them all the way to the aft end of the Zvezda Service Module. On their way to the work site, the crew captured imagery of the SKK No.9 materials science experiment that exposes a range of different coatings and materials to the space environment for an extended period of time before returning to Earth. 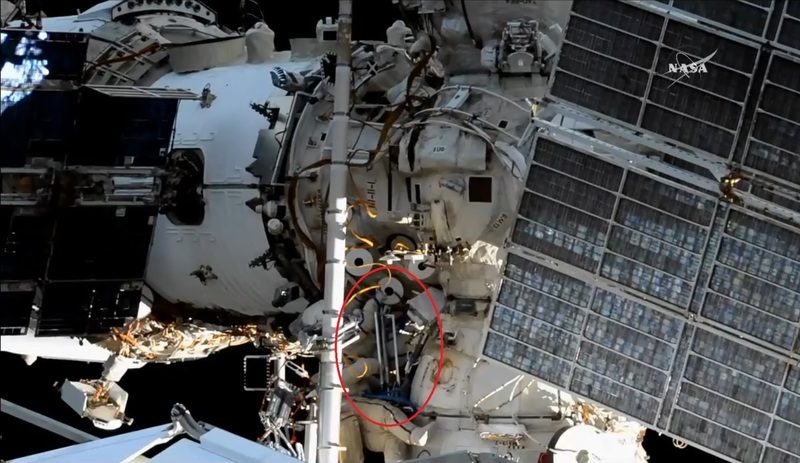 On the aft end of Zvezda, the Cosmonauts put in place a mechanical strut between hand rails 2624 and 2622 as an installation location for future experiments. Next was the installation of Impakt – a materials science study looking at the combined effect of thruster residue and the space environment on different materials to help inform designs of future spacecraft. The thrusters of the Space Station – used to maintain the ISS orbit and assist in orientation control – burn toxic hypergolic propellants. Combustion products are clean gases, but no system is 100% efficient and all thrusters also release a fraction of propellants that remains unburnt which creates a potential issue due to the propellant’s toxic and corrosive nature. Studies like Impakt or its predecessor ‘Kromka’ deploy samples close to the thrusters to see how different materials are affected by thruster residue to identify materials that can withstand corrosion and are less prone to accumulating residue. Impakt was secured right on the rim of one of Zvezda’s thruster pods and will remain there until 2019 before being retrieved for analysis. 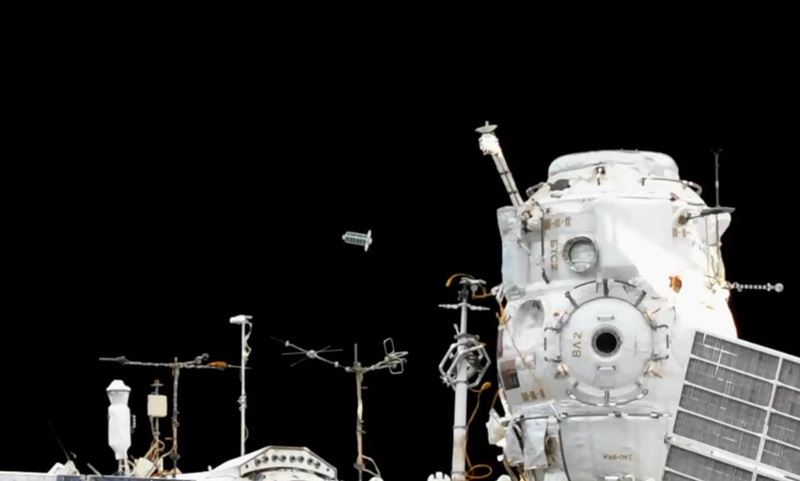 Wrapping up work on Zvezda, the Cosmonauts took engineering photos of the ОНА antenna boom and translated forward. Wipes were used to remove thruster residue from their suits to ensure no harmful substances are carried into ISS with wipes being thrown overboard after use (approx 17:25 UTC). The crew then stopped by Pirs to swap out equipment and moved up to the Poisk module for a series of activities, starting with the installation of a short-cut hand rail between Poisk and Zvezda to allow for quicker translation on future EVAs. Some extra effort was required to lock the hand rail in place and bolt it down on both ends to establish a secure translation path. Next up was the “Test” experiment that involves a series of samplers to collect surface samples from the outer protection layer of ISS and the windows. The Test Experiment aims to study how different materials behave in the challenging space environment over a long period of time characterized by harsh thermal variations on every orbit, high doses of radiation and atomic oxygen causing corrosion. 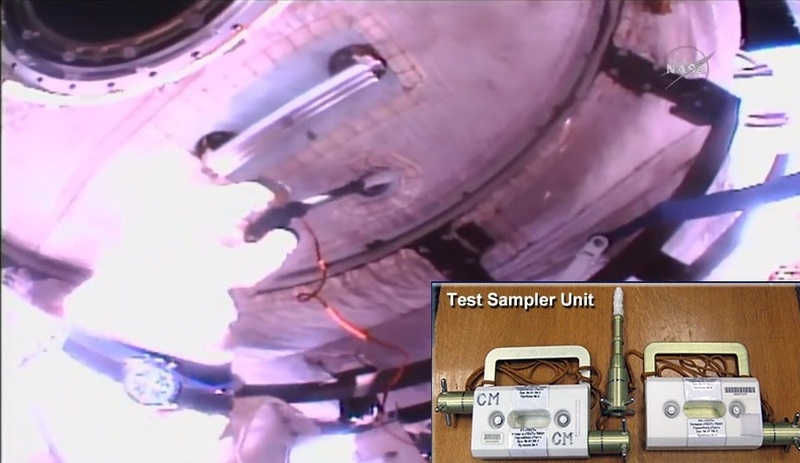 Test also looks at the distribution of thruster residue and potential microbial activity on the outside of the Space Station which has proven to be an interesting area of research based on the previous ten Test samples that have been returned so far. Test sample No. 11 was obtained from the VL-1 hatch area on Poisk and the crew deployed Exposure Unit No. 15 – a new addition to ‘Test’ that will leave a series of witness plates outside the complex for a defined period of time to collect thruster residue from different sample areas for a three-dimensional quantitative analysis. A quick task completed by Sergey Ryazansky was the re-positioning of the БКДО Plume Impingement and Deposit Monitoring Unit to view a different sector of ISS to monitor the expansion of thruster plumes from arriving spacecraft and deposition onto ISS structure. 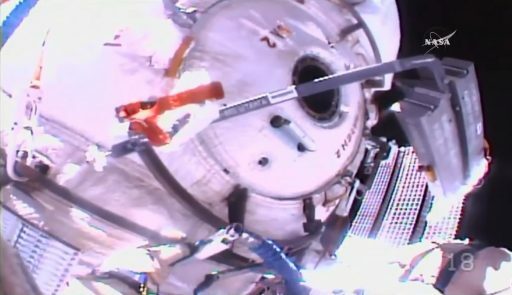 Next was another structural enhancement, specifically the installation of a strut between hand rails 6006 and 6013 on the Poisk module to be available as translation path and mounting surface for experiment units like SKK. 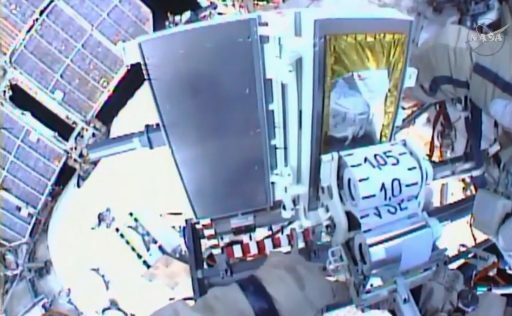 The spacewalkers’ patience was tried again with this strut, spending over half an hour until the strut was fully secure – causing the EVA to drift over an hour behind the timeline. Another hand rail installation between Poisk and Zarya was given up on altogether after the fit again proved out to be difficult. 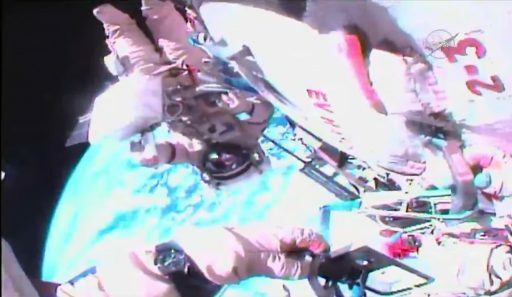 While still in the Poisk area, the spacewalkers obtained Test sample No.12 from the VL-2 hatch and deployed Test Exposure Unit No. 16, followed by the installation of an array of thermal sensors within view of the VL-2 window to measure thermal fluctuations around the Mini Research Module added to ISS in 2009. Yurchikhin and Ryazansky then made their way back nadir to the Pirs Module where they collected the Test No.13 sample and installed Exposure Unit No. 17 on the VL-2 hatch (not in use for the EVA) and Test No. 14 / Exposure Unit No. 18 on the active VL-1 hatchway. 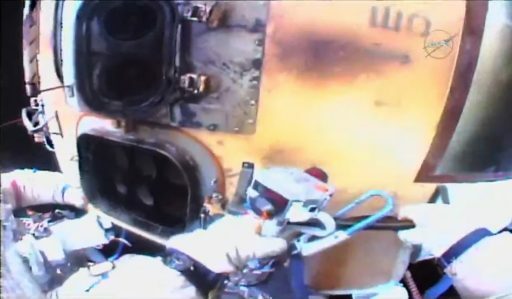 This enabled them to close out their spacewalk with all but one objective checked off, closing the Pirs hatch at 22:10 UTC after an EVA elapsed time of seven hours and 34 minutes. The next spacewalk activity coming up on ISS will be a triple header with three USOS EVAs planned in the October / November time frame to facilitate the replacement of a Latching End Effector on the Station’s robotic arm to keep it in good working order for vehicle captures and external handy work. The next Russian EVA is currently scheduled for January 2018 and will be performed by Aleksandr Misurkin and Anton Shkaplerov. 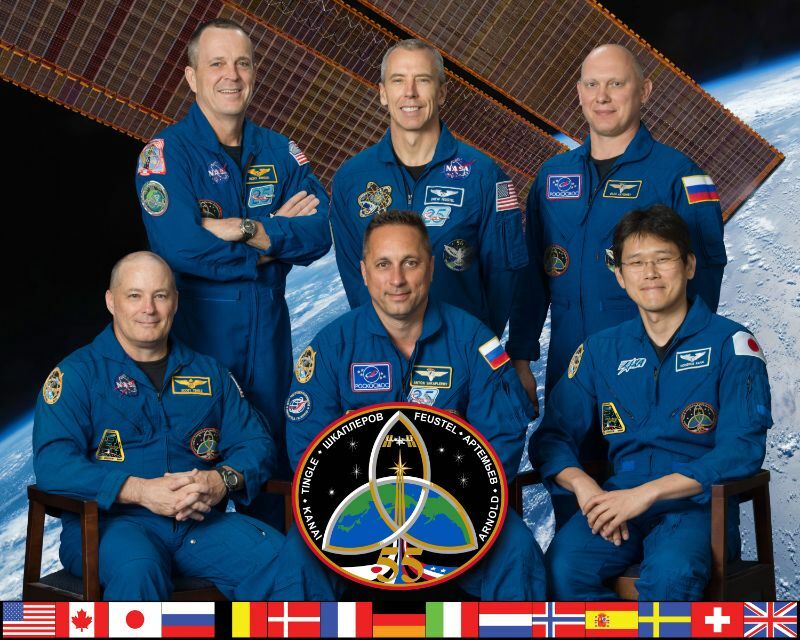 Copyright © 2019 Spaceflight101 – International Space Station. All rights reserved.